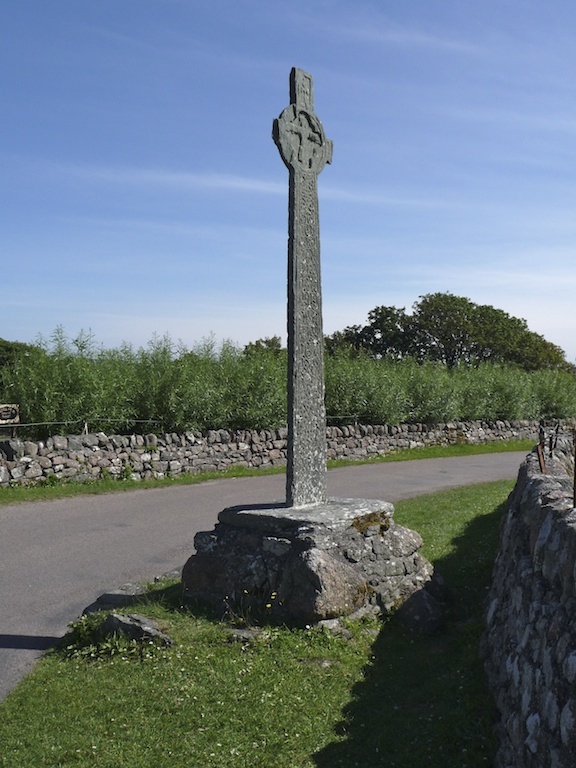 Between Iona’s Benedictine Abbey and the ruins of an Augustinian nunnery stands a beautifully-carved medieval cross. Maclean’s Cross – so named because it is thought to have been commissioned by a chieftain of that clan – dates from the 15th century, and it stands at the point where three ancient tracks meet. 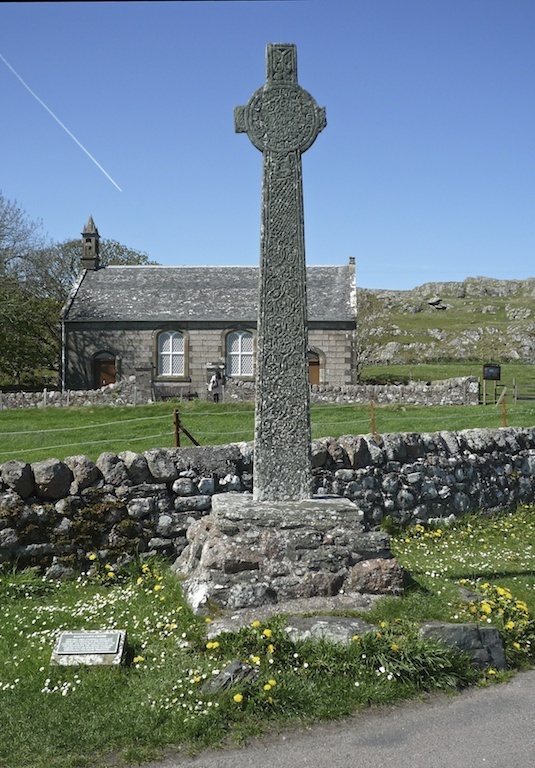 Historic Scotland describes it as ‘a wayside prayer-cross’, and ‘a fine example of the Iona school of stone-carving’. Pilgrims in the Middle Ages would have paused here on their way to St Columba’s monastery and the 12th century nunnery, which are only a short walk away. One of the tracks on which the cross stands is the ancient Sràid nan Marbh (‘Street of the Dead’). This is the path that would have been taken by funeral parties bearing kings and chieftains to their last resting place on the sacred island, and it runs from Martyrs’ Bay to Reilig Odhrain chapel; apparently, it also passes the site of the bakehouse, which offered food by way of welcome for travellers and pilgrims. The disc-headed cross stands three metres high, and both sides display intricate carvings; on the west-facing side is the crucifixion, while the eastern side is adorned with animals. Both the arms of the cross have suffered damage and erosion. The shaft is carved with an amazing design of plaitwork interlaced with leaves; an armed horseman at the foot of the cross may represent the Maclean chief who commissioned it. Or you can read more about Iona’s beautiful Augustinian Nunnery. As always, I enjoy reading your posts. The Maclean’s Cross I especially like. Thanks! Thank you so much! I’m glad you enjoy them. I love the Maclean’s Cross, and Iona in general, as I’m sure you know! Wow, the cross is really tall! I don’t remember seeing it when I was on Iona, but now I really want to revisit. It is very tall, and because it’s so thin it looks even taller. 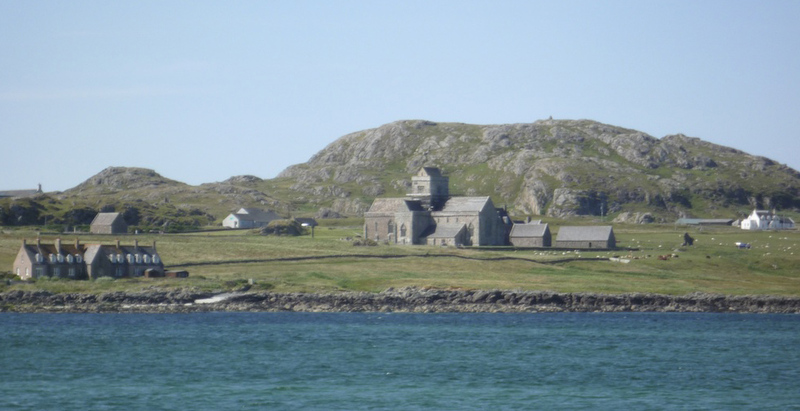 I would so love to have seen Iona in early Christian times! We want to go there again too, the corncrakes will be busy croaking! It is just amazing to me to see structures from that long ago. I love your history lessons! Thank you, David! I think they’re amazing structures too. Glad you enjoyed it.